Uthradam Towers is located close to Trivandrum Station which makes it convenient for visitors to reach without the hassles of locating the property. Homely comforts with premium facilities are offered at the hotel. 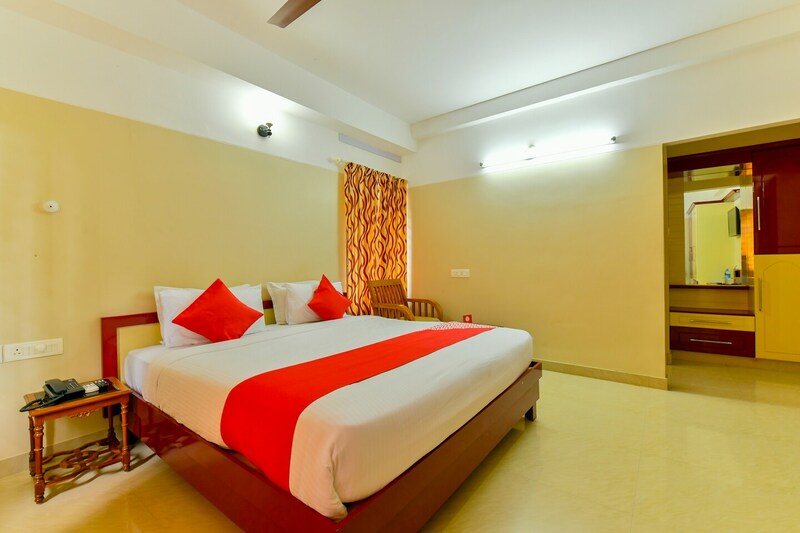 Spacious, elegant, bright rooms with modern amenities are provided for guests to enjoy a pleasant stay. Rooms are simply decked with minimum wall decors and windows provide a stream of natural light which lifts up the ambiance of the room. Patterned and colourful wooden furnishings add a beautiful look to the rooms.Colourful passageway along with well-furnished living and dining area and free WiFi service ensures guests have a truly comfortable stay. Do check out nearby attractions such as Legislature Museum, Chandrasekharan Nair Stadium, and Memoriam of Men of the Indian Army.